The mobile advertising market continues its rapid growth and seems that the market will become more competitive with the increasing number of publishers and ad networks. Ad networks seek new opportunities, new solutions for the publishers to sell more inventory and get more conversion. On the other side, publishers put more effort to increase their mobile earnings through programmatic advertising, and demand higher eCPM and fill rate from the ad networks. High volume trafficked publishers distribute their traffic to multiple ad networks to yield better monetization. Tracking all these networks’ data regularly, keep all the adjustments on each network’s dashboards fresh is a hard process to manage. At that point, mobile mediation system emerges to help publishers for performance analysis and better optimization. Lots of ad network and independent companies mushroomed and pledged to “maximize your mobile revenues”. Then, Admost Mediation brings a new term into the mobile advertising; “Router” to cover all mobile monetization needs of publishers based on the team’s past publisher experiences. What makes Admost Mediation Router different and special against the other mediation tools? Why Admost Mediation is capable to “maximize your mobile revenues”? Most of the mediation systems are the extension of an ad network that aims to serve their own ads to quality traffic and call other ad networks for backfill inventory. Sending low-quality traffic to ad networks trivialize the value of the ad requests which is not a good option for better monetization. Admost Mediation is a sole friendly mobile ad mediation platform between ad networks and publishers; not an extension or a part of an ad network to serve its own inventory first. Admost just works as a “router” to serve the best yielding ad networks in automatic waterfall order. All mediation systems use eCPM values which are calculated by ad networks to create a waterfall. They calculate eCPM value by dividing the revenue to number of impressions they have counted. But counting the impression of each ad network may alter in some metrics; time of showing ads, call-to-action etc. So each ad networks may manipulate eCPM values to take advantage of being up on the waterfall. Though, Admost Mediation SDK counts all impression itself and stores them on its own database per country and placement to calculate optimal eCPM values. It imports revenue data from ad networks and divides it to the impression numbers in Admost database. So eCPM rates of each ad network in Admost is calculated with the same methodology to get the most accurate waterfall. Admost Mediation doesn’t allow ad networks to manipulate publishers’ inventory. The mediation systems with automatic waterfall order only consider eCPM rates or revenue of the ad networks to send a request in order. Highest eCPM rated ad network always has a first advantage to serve its ad first, which will cause other networks to get lower ad request and decrease in eCPM rates. Always requesting the same ad network limits the diversity of the ads and decreases the value of the placement/ ad zone. That will bring up lower click through rate and conversion; the efficiency of a single ad network in long term. Admost Mediation’s algorithm is based on the weighted eCPM rates including fill rate and also the diversity of the ads distribution. Primary objective is to increase the conversion of the ad placement to gain the maximum efficiency from each network. 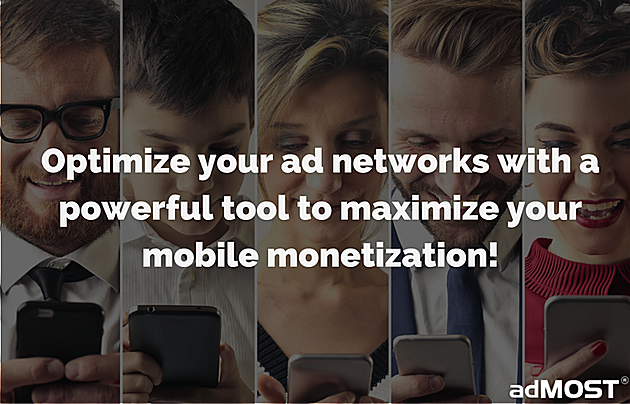 Higher conversion rates in each ad network improves the quality of the ads which means higher eCPM values and revenues for the applications. Admost Mediation Router is free of a charge for the first month! Start maximizing your monetization now! Previous PostWhat makes Admost different among other mobile ad mediations in 3 clause? Next PostThe Funeral of Low Fill Rate and eCPM!